On the shore of Lough Neagh, Co Tyrone, St Colman founded a monastery in the sixth century. 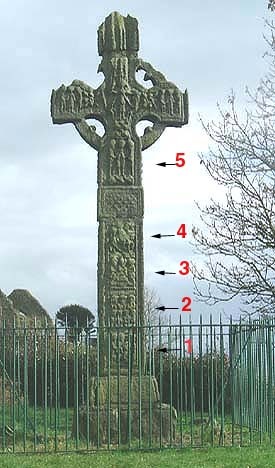 At the entrance to the graveyard stands the third highest cross in Ireland and the tallest in Northern Ireland, this 10th century sandstone cross stands to a height of 5.6 metres approx. The west face pictured right bears many biblical scenes. 5. Mocking or Arrest of Christ ? The West Head bears a crucifixion scene. Pictured below are a couple of scenes from the East Face, Daniel and Adam and Eve, as you can see the East Face is more weathered than the West Face. There are figure scuptures also featured on both the North and South Sides. Situated: On the Western shore of Lough Neagh, County Tyrone. From Armagh take the A29 North to Cookstown then take the B73 West, drive about 8 kilometres down this road, then take a right sign-posted turn for Ardboe. Discovery OS. Map: 14 H 966 756. Nearest High Crosses featured on this website.